No smoking either in caravan or outside on veranda. Bookings for 2018 now being taken. 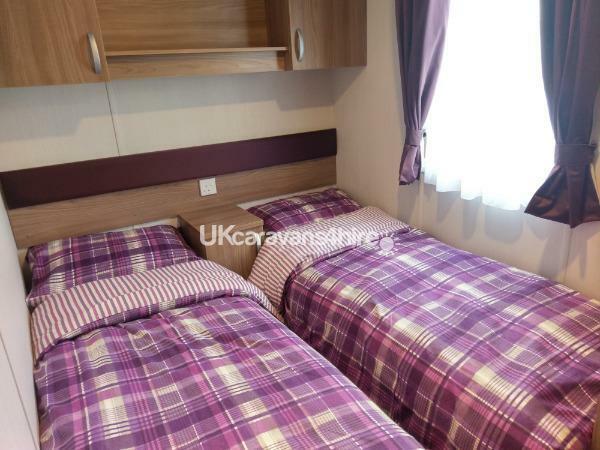 Luxurious 6 berth caravan to Haven's 'Platinum' standard. 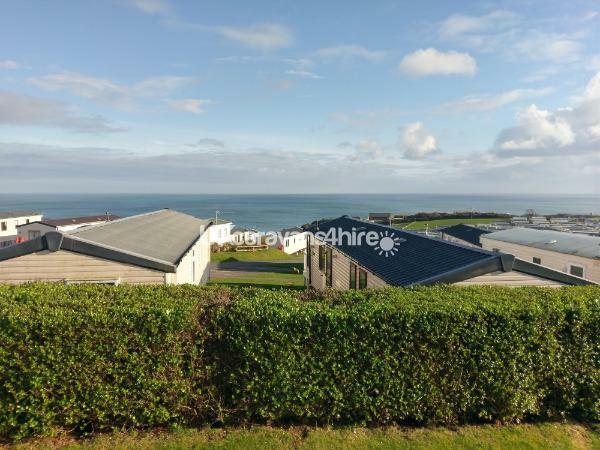 Excellent views of both the sea and the park. Wrap around veranda. Spacious end plot. Gas central heating, with electric fire in lounge. Main bedroom with double bed and en-suite. Two other bedrooms are twin rooms. Bathroom consisting of toilet, wash basin and shower. Kitchen comprises a full size fridge/freezer, gas hob, gas oven, sink, and storage cupboards. Included is a full inventory of cutlery, cookware, and cooking utensils. Dining table complete with six chairs. The lounge area has a 40" TV/DVD player, Bluetooth speakers, free-standing furniture and double French doors that open out on to the veranda. Please note that entertainment passes are not included. These can be purchased from reception on arrival. I have stayed with my family at the caravan several times. The location is great and the caravan facilities are perfect and very clean. 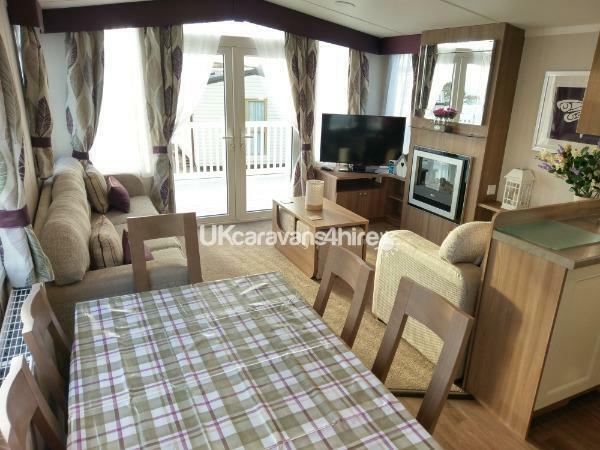 We have been in the summer and winter and the caravan has all you need for all seasons.. it’s warm and cosy on a cold day and spacious outside with an amazing veranda on a sunny day! We've just returned from a 7 night stay in Debbie and Matt's caravan and had a thoroughly enjoyable time.The caravan was spacious, spotlessly clean and well situated. Everything we needed was provided and it was a bonus that we didn't have to pack bed linen, pillows, towels and tea towels. It was also a nice touch by Debbie and Matt to leave some treats for our arrival and much appreciated after our long drive. Our toddler daughter had fun running around the safely enclosed veranda and playing on the flat grass area just outside (quite rare at Devon Cliffs!). Not even the grotty weather spoilt the fantastic views from the caravan. I wouldn't hesitate to stay here again and shall certainly recommend it to family and friends. We've just returned from a lovely week at this caravan. From the start the booking process was easy and efficient, and upon arrival we were greeted with a lovely surprise which was very welcomed after our long drive. 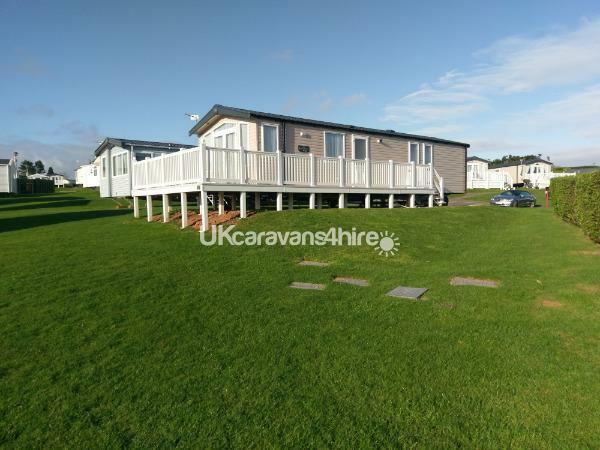 The caravan's in an excellent location, with a grassy area beside it for the kids to play in. Lovely clean, new caravan and we'll definitely be returning, thank you. We had a fantastic 4 night stay in the caravan. 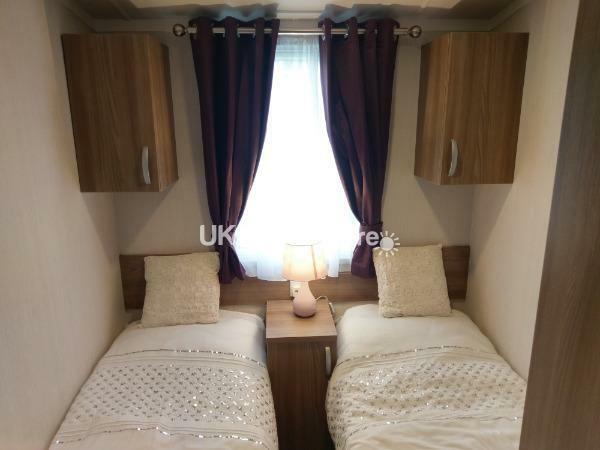 Prompt and efficient booking through the owners.. upon arrival at the caravan we were very impressed the caravan was extremely clean.. a nice touch was the leaving of teabags milk and wine chilled in the fridge along with glasses! Even a few bags of haribos for children which went down well. 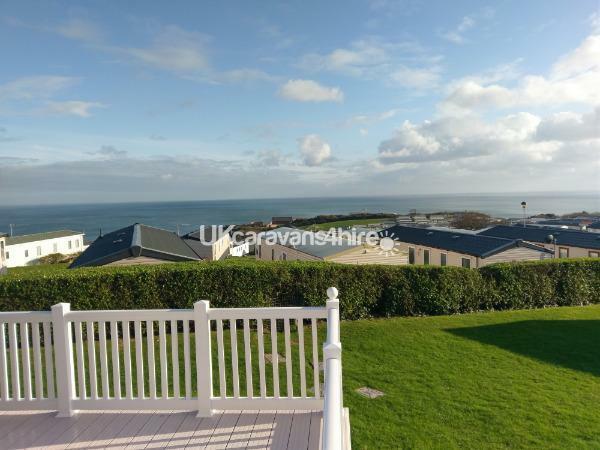 The caravan was in a perfect position with a seaview. Great location wih everything in walking distance. Would definitely recommend this caravan!! We have just had a last minute break away and it was just wonderful. The caravan itself was perfect. We loved the layout and felt very much at home. The double doors leading to the decking area made it feel very open and a great space to be in. Everything was ten out of ten. I would definitely return and I’ve given the details to my sister who wants a trip away. We have three girls under 6 and they just loved it. The owners made everything really easy. There was great communication throughout and such lovely special touches as arrival gifts. They really have thought of everything. I left my trainers behind and the owners were so helpful posting them back to me which I really appreciated. Thank you for our wonderful holiday- we hope to return! Had a fabulous stay at Devon Cliffs made even more special by our accommodation, the caravan was immaculate and a pleasure to come back to after a day out, feeling like home from home. Booking couldn't have been easier with immediate responses from Debbie who was extremely helpful. On arrival the bottle of wine and sweets for the boys was a lovely touch and greatly appreciated. Would highly recommend. Fantastic stay at a beautiful caravan which was spotless and complete with all the mod cons you could possibly require. Communication with the owners was fantastic and the little treats on arrival were a lovely touch. Would recommend to anyone and can't wait to return! 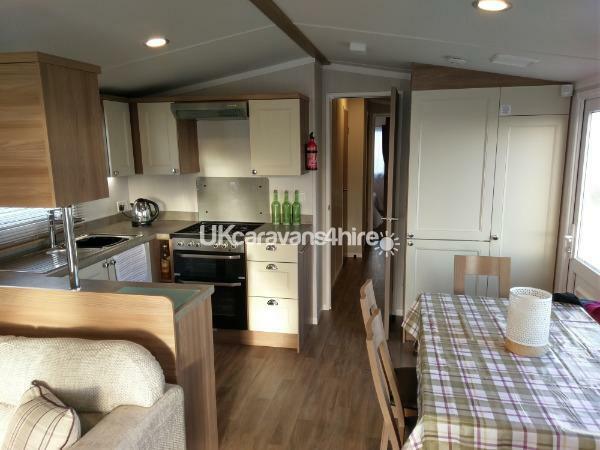 A very beautiful caravan with everything you need and more. Communication was fast and reassuring and we even managed to get a late check out. The welcome pack was a wonderful surprise, particularly enjoyed by the children. We would definitely book again. What a wonderful find. A beautiful caravan in a great location with wonderful hosts. The whole experience from start to finish was easy. Communication was quick and effective. The price for the week was very reasonable. And the added well thought out extras were a real treat. Thank you for a fabulous break Debbie and Matt. We will definitely be booking again. ???? We had a wonderful week at Devon cliffs, made even more enjoyable by staying here. 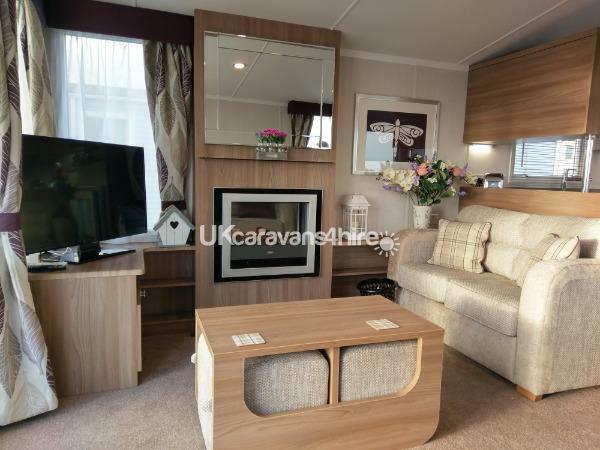 Very high spec caravan, everything you need for a luxury caravan holiday. The extra touches on arrival and the provision of essentials was a very much appreciated. Matt and Debbie were very responsive and helpful before and after our stay. Would thoroughly recommend a holdiay there. Thank you! Had a great weekend, location of caravan is excellent, caravan extremely clean and the extras in the caravan on arrival were a very nice addition. Plenty of space around the caravan for our children to play. 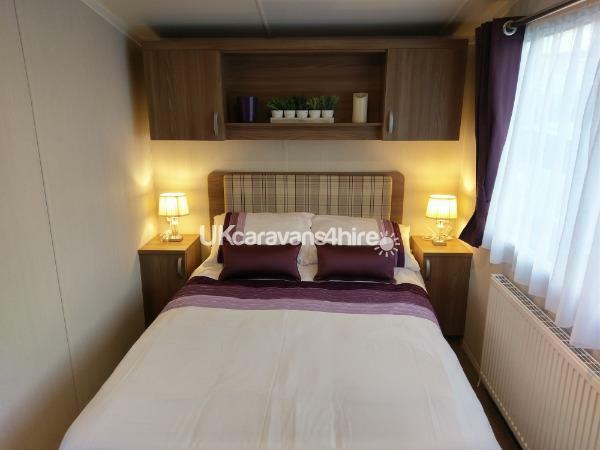 A very good price for a stunning caravan which was only a few minutes walk to the pool/showbar. Would definetly return, could not fault. We had an amazing half term break here with our 10 year old daughter and my parents. 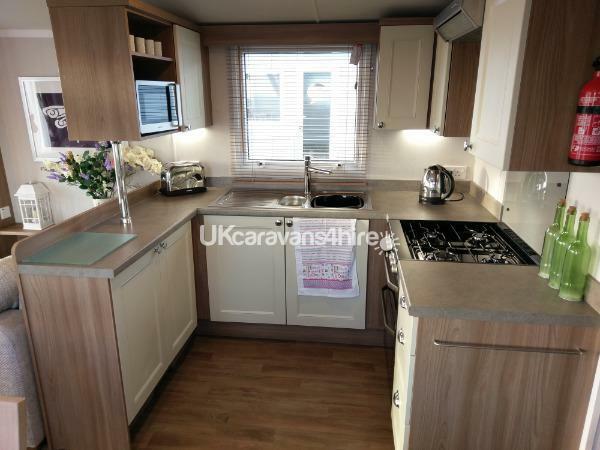 The caravan is of an exceptional standard with every mod con you could think of. The view is to die for and is in a peaceful area, not too far from all the entertainment etc. We would definitely visit again. Thank you Debbie and Matt. What a fantastic Caravan and fantastic sight. This was a beautiful caravan we had no problems with the booking and the owners have certainly set the standards high. We arrived to find extra little touches which are excellent after travelling for some time. We will be coming bk to stay when we revisit Devon. Excellent in every way. Our expectations were definitely exceeded on our holiday. 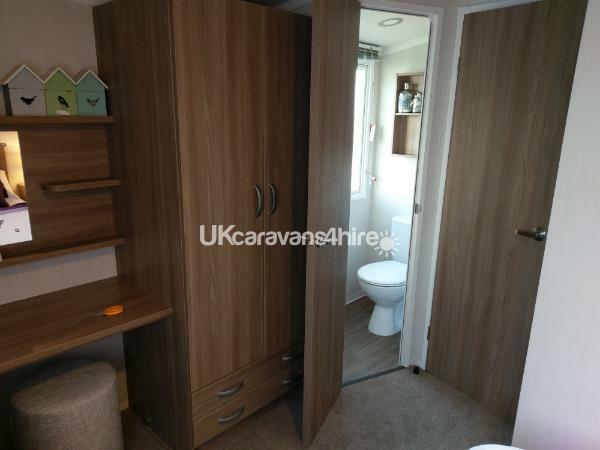 Firstly the caravan was of a very high standard and definatly worth the price paid. On our arrival we were pleasantly surprised with essentials needed allowing us to to have a cup of tea after our long journey. The plot of the carvan was amazing allowing our young children enough outside space to play safely.Thank you Debbie and Matt we will definatly be booking with you again. You have really set the bar for future holidays with your lovely caravan. From start to finish dealing with Debbie and Matt was very smooth and they put us at ease after booking our first family holiday. The caravan was emmculate, must have been top of the range, the prices were very reasonable and we were greated with drinks for the adults and sweets for the children. We will definitely be back next year.